Cross-project releases are used to manage joint releases, dates, and milestones across multiple individual projects. 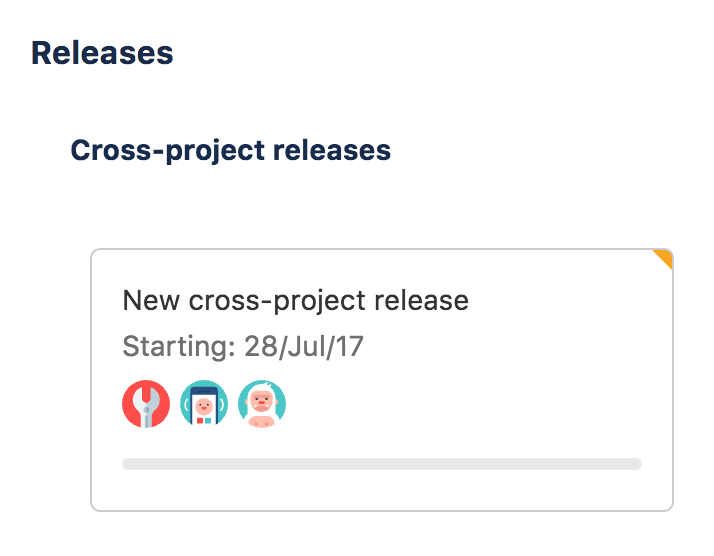 When you create a cross-project release and commit it to Jira Software, the release will be transformed into a regular release in each of the Jira projects that are part of the cross-project release. 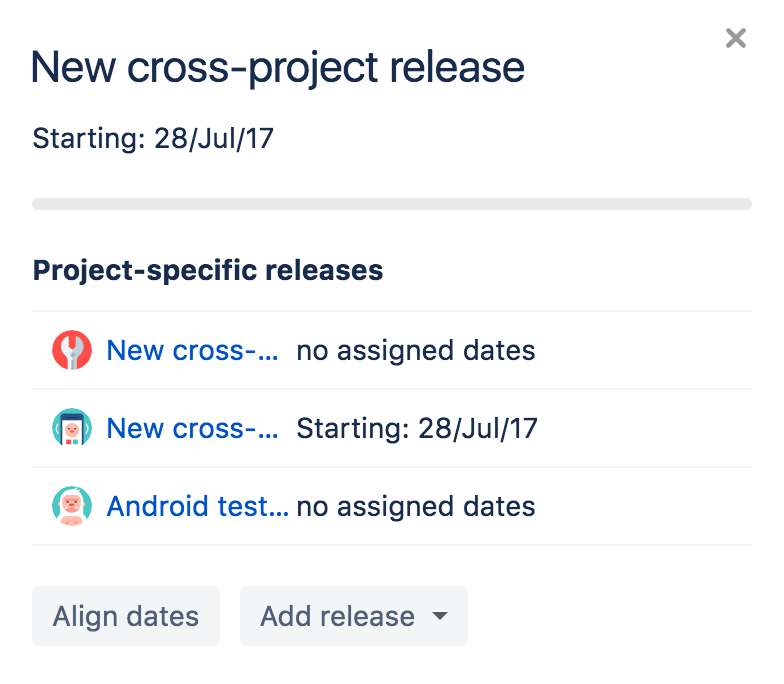 Issues assigned to the cross-project release in Portfolio will be assigned to the respective project-specific release in the issue's Jira Software project. Select the release name, choose Cross-project release. Click Add and select the projects that will be sharing this release. Once you are happy with the configuration click Create release. Once you've created a cross-project release, you can group existing releases into the cross- project one. Go to Releases > Cross-project releases. Click the Cross-project release name. Now you can see the details page. Click Add release button to add existing releases. Select the release you want to add. Keep in mind that you can only have one release from a project in the cross-project release. Your new cross-project release will be visible under Releases. The cross-project releases' dates are aggregated from the project-specific releases. The start date will be the earliest start date and the end date will be the latest end date from the project-specific releases. Select the release you want to modify and click Edit to see the details. From here you will be able to edit, remove, delete, add more releases and align project-specific release dates. Add more releases to an existing cross-project release by going to the release details view and clicking Add release. Select the cross-project release you want to delete and click and click Delete. You can delete a cross-project release without deleting their children by un-checking the box in " Exclude all releases that are part of this cross-project release from this plan as well. In the following case, the TIS company has to improve the loading data time in Android since they are receiving users complaints. In order to accomplish this project, the backend team will have to work with the Android client side team. Each team works on different projects and releases and they have to combine efforts to get this improvement done. Create a cross-project release by following the instructions provided above. In this release, you will be including both, Performance and Android teams. 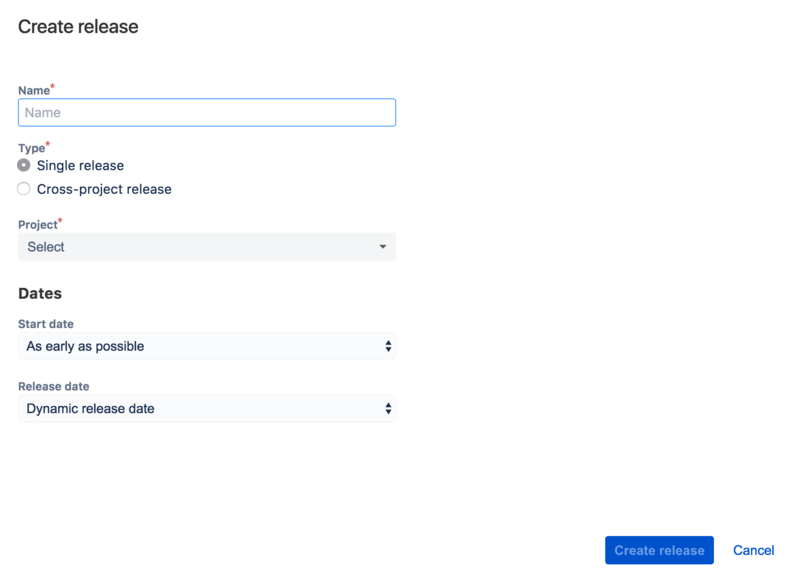 Once the cross-project release has been created, Portfolio for Jira creates a project-specific release called "Data load system improvements" for each Jira Software project as you can see in the caption above.